﻿﻿﻿﻿﻿ Take one of the most often told tales in modern times, adapted by one of the best Scottish playwrights and staged by one of the better up-and-coming young theatre companies and you’d be in line for a cracking night out at the theatre right? Right. You certainly would be. As part of their pre-London tour Sell A Door Theatre Company are travelling the length of the country staging this classy production and I am so glad I managed to catch up with it at Dunfermline’s Alhambra Theatre this week. 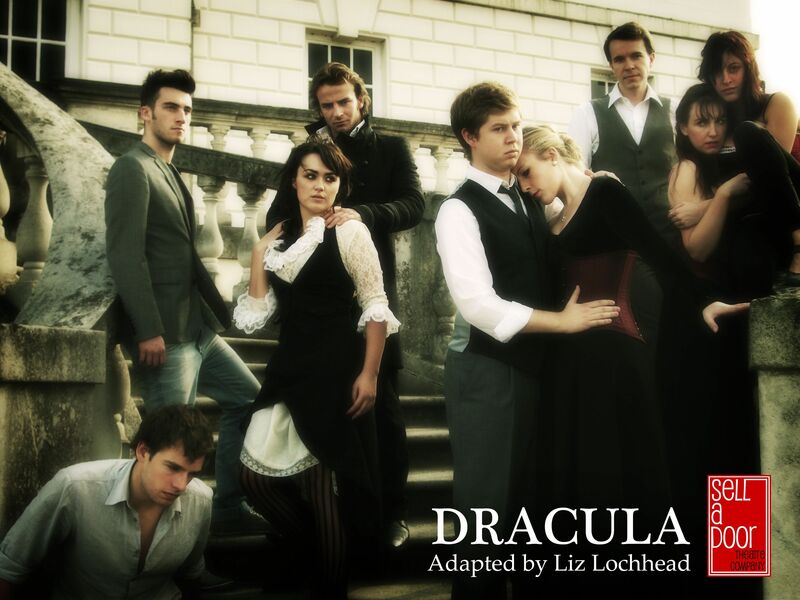 Dracula, an adaptation of the Bram Stoker novel by Ms Lochhead, is set in 1893 and the action takes place in Whitby, Hungary and London with young solicitor Jonathan Harker journeying to meet the Count to do what he thinks is some routine business, but of course he is mistaken. The vampire has designs on Harker’s young heiress wife Mina and her sister Lucy, but can Harker ably assisted by his friend Arthur Seward and Van Hesling stop the Count before he unleashes his terror on one and all. This is a really well written play, very different from many of the interpretations I have previously seen of the Stoker classic and the production is compelling. Each of the nine actors play their roles with feeling and style creating a true ensemble feel to the piece, but I feel the undoubted highlights are in the design and direction of the production. Director – Producer David Hutchinson has utilised some first-class devises and effects throughout the two hours and this coupled with a simple, yet worthy set design left many in the audience in awe at the end product created in conjunction with designer Adrian Gee. The whole performance was underscored with atmospheric music composed by David Ben Shannon. With the recession biting I suppose it is enviable that some productions are drawing smaller audiences than before and it was a shame for all involved that there were not more at this performance to witness what was in truth a fine evening at the theatre. Question: I am with a producer for a high school in Toledo, OH USA and I love the script but I cannot seem to find a place to buy the rights to perform the show. Can you please help at all?